Most commonly yachts feature an inboard engine which exits through a stuffing box to a cutlass bearing and prop. Or they feature an outboard motor attached to the transom. But there are a couple other alternatives including sterndrive (I/O), jet, and pod drives. Let’s survey the type of yacht and qualities of each of these drive types. The yacht I am most familiar with that features a sterndrive is the Gemini 105MC catamaran. From the outside, she appears to have an outboard motor, but when you get close, you realize that the engine is inside the centerline lazarrette. 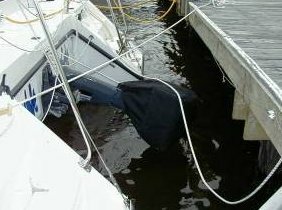 The benefits are a small footprint, ability to tilt up the outboard, and lower cost of installation. Disadvantages are higher maintenance costs because of the tight location and vulnerability to water corrosion. 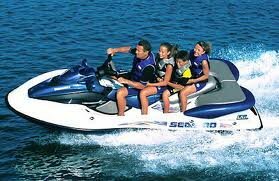 Jets are most famous on Sea-Doos but also common on waterski boats and even some larger vessels. These types of vessels propel themselves via a nozzle that spray high pressure water. They can turn on by redirecting the jet via a deflector and go into “reverse.” Other advantages include the safety of not having a spinning blade, high speed, and minimal draft. The biggest disadvantage is efficiency which has increased but still cannot compete with the energy consumption of a prop drive. 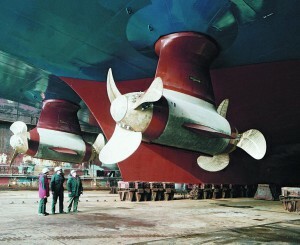 Pod drives are in vogue on larger vessels and seem to be future of propulsion. They have all the benefits except that which you would expect with new technology such as cost, consistency, and support. These devices come in two general types: (1) those in which the motor is located inside the vessel such as on a saildrive and (2) those with the motor inside the pod such as a Zeus Pod. Most have a transmission which allows the pod to be rotated 360 degrees (so called Z-drive) and negates the necessity of a rudder of a yacht. Many have the prop fixed to the leading edge of the pod or two counter rotating props. Besides the outboard on your dinghy and inboards in your yacht, there are at least three more distinct types of propulsion such as stern, jet, and pod. Jets continue to get more efficient and pods more reliable so expect to see more of these types of setups every year.